Following from last week’s post, here are some photographs of organ stop groups. See how quickly you can spot the diapasons and the flutes. The first one is from a very straightforward pipe organ (the Salicional is a string stop, and the Twelfth a mutation). Next, part of an electronic. Diapasons 8′, 4′ and 2′ are there, but the word ‘diapason’ doesn’t appear at all. Note the consecutive numbers running across the top of the stops. These can be helpful if you just want to note a setting without thinking it through, but you don’t learn anything from them. The important numbers are the 16, 8, 4 and 2 at the bottom. Also note the ‘II/I’, second from the right. This is a coupler. 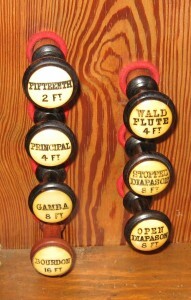 the SCOTS chart of organ stops from the blog post of 8 January 2010. Always check out the diapasons and flutes first. If their sound isn’t right for what you want in your church, go no further and turn to the next instrument. If the sound is OK, have a look at the other stops – reeds, mutations and mixtures – which we haven’t gone into, using the chart. Try reeds such as Trumpet or Oboe as solo stops against, say, flutes on the other manual. Listen to the string stops. Try each mutation and mixture on top of one or more basic hymn or voluntary settings. Test out the couplers. Lastly, as I’ve said before, avoid unnecessary gadgetry. What you don’t need are automatic rhythms, non-organ voices (e.g. orchestral or jazz), recording facilities or any other similar gizmos. They don’t help in mainstream church services, and they add to the price, sometimes quite considerably. There is usually a much simpler model, and if the supplier hasn’t got one in stock for you to try, it is worth either waiting until he has, or finding out which local church has one installed and asking to try it. And finally, just to demonstrate that nothing changes, here are the Great and Pedal stops of my own 1874 instrument, which is not a large one. The Gamba is a string stop, and the Bourdon is the only Pedal stop. But diapasons and flutes are all present and correct.